Hello! Happy Saturday! Any crafty plans for you? Now that the winter chill has returned here in CNY, I'm snuggling in and hanging out in my craft room today. Got my coffee, and cozy fire burning and I'm ready to create. In the meantime, I wanted to stop by to share a little bit about finding inspiration with you. I know I had talked about this in the past, but it is still a pretty popular questions so I thought it was worth bringing up again. And the answer is.....anywhere you look! Look around. You will find color combinations that you will love, you will find a photo or magazine layout that can get you thinking about card and scrapbook layouts; but the absolute best place to find inspiration, is in your catalogs, new and old! Yes! Old catalogs can be a wealthy source of inspiration for a card! Stampin' Up! has some of the BEST designers in the business and they are literally handing you over idea after idea. You can CASE ("copy and share everything") exactly or you change up the color combinations, change out the stamp set or just change a few elements, it's completely up to you. That is one of the greatest parts about the paper crafting industry, you are actually encouraged to CASE! We're flattered when you like something enough to copy! Now, don't get me wrong, it is completely appreciated when you credit the originator and is the right thing to do, but the point is, don't sweat it and think, "I'm just not creative enough to make my own cards", because that's just not true! You do not need to come up with any idea on your own! 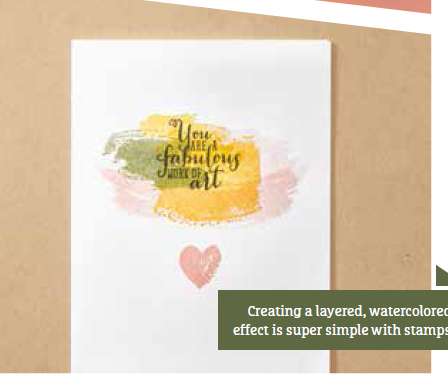 Here is an example of a card I cased using last years annual catalog! Yes, a catalog that is a year old was my source of inspiration! I just down sized the card and changed the orientation of it as well as changed the verse as I needed a thank you card for a customer and I thought the overall design of the card was perfect. So, what do you think? I Love looking through old catalogs for ideas along with checking out YouTube and pinterest...any other ideas, just Google stamping card ideas or any combination of words you can think of such as rubber stamping, scrapbooking and stamping you will be surprised what you find. I just recently found a website www.scrapbook.com and they have card ideas using their products. You could go to stampinup.com, stampin from the heart, etc. or join the fun on Katrina's FB page and take her weekly sketch challenge. Thank you for the plug Nancy! And yes, Pinterest and YouTube are full of ideas!